The compact color sensor FT 55-CM from SensoPart is extremely versatile and easy to use and is therefore ideal for diverse color detection and sorting applications. Thanks to its wide scope of functions and impressive user comfort, the color sensor FT 55-CM is unmatched in its performance class. 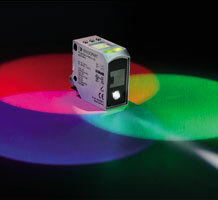 The extensive operating range and flexible color detection function – the sensor can distinguish up to twelve colors – enables a multitude of applications. The large integrated LCD display and remote configuration via SensoVisual and IO-Link set new standards in ease of use and connectivity. This unique combination of characteristics makes SensoPart’s new color sensor ideally suited for challenging color detection and sorting tasks in all sectors of industry, e.g. differentiation of differences in color on automotive fuses or the identification and assignment of bottle tops or color labels in the packaging and beverage industry. The FT 55-CM is available in three different operating ranges (12-32 mm, 18-22 mm or 30150 mm). The first two versions (FT 55-CM1 and -CM3) are specially designed for the closeup range: thanks to effective glare suppression, the CM1 version enables reliable color detection even on reflective surfaces; the CM3 version with a narrow light spot (1 x 4 mm) and double the switching frequency (6 kHz) is perfectly equipped for the detection of small targets and high-speed applications, and can be used e.g. as a contrast sensor in color-critical applications with registrations marks in the printing industry. The long-distance version FT 55 CM-4 offers a maximum scanning range of 30 to 150 mm with a high depth of focus. The wide operating range combined with the sensor’s ability to detect color regardless of distance enables highly versatile applications. The color setting options are also flexible. There are two operating modes – color detection and color assignment (Best Fit). In the first mode, individual colors or color ranges can be taught or – for targets with considerable fluctuations in color intensity or value – scanned. Finely graduated color tolerances can be selected (nine levels) or individually adjusted via IOLink. The detection of several colors can also be linked with logical operators, or a color can be detected and a second imperatively excluded. In Best Fit mode, no tolerance settings are required as the sensor always automatically selects and outputs the best match amongst the colors taught. This mode enables reliable detection even with strongly fluctuating color values. In both modes, the FT 55-CM can also be used in triggered operation, enabling a reproducible detection of the finest color differences even under difficult conditions. Only a few color sensors in the market have such a trigger function. During color detection, the FT 55-CM can also optionally take color intensity into account. Thanks to simultaneous distance measurement, the intensity is reliably identified and evaluated regardless of the distance to the object. This enables precise differentiation between a change in intensity or the presence of two different colors. Accurate color detection is therefore guaranteed even with fluctuating object distances; the function is also useful for the detection of “non-colors” such as black, white and grey. An entirely new development in SensoPart’s generation 4.0 sensor technology, FT 55-CM was designed from the beginning to meet the demands of digitised industries. It includes an IO-Link interface for remote configuration, data output and monitoring. The sensor’s switching behaviour can also be flexibly adapted to suit the application. The version with a 5-pin connector offers three freely configurable switching outputs, which can be assigned up to seven colors using binary coding; the 8-pin version even has five outputs for up to twelve colors. Thanks to factory-installed smart functions, the user can also configure each switching output individually – without the need for additional programming work in PLC. It is possible, for example, to select light or dark switching (NO/NC), define a switch-on or switch-off delay or set a target counter – e.g. so that only every fifth signal is output. Even the sensor’s display screen and indicator LEDs can be individually configured to show only relevant or required information. Simple and intuitive use of all these functions is facilitated by the FT 55-CM’s large integrated display with soft keys, which replaces the cryptic LED or segment display widely used in this sensor class. Configuration via IO-Link with the aid of the graphical user interface SensoVisual offers even greater user comfort: complex color profiles can be easily created and saved on a tablet or PC and quickly transferred to the sensor when needed. Besides offering an extensive range of functions and easy use, SensoPart’s new colour sensor also comes with everything necessary for simple installation and reliable operation. The FT 55CM is equipped with a robust, hermetically-sealed metal housing (IP 67/69/Ecolab) of compact dimensions (50 x 50 x 25 mm) and highly resistant 270° rotating metal connectors. The robust sensor design is enhanced with clever accessories such as the SensoClip mounting component for easy mounting and fine adjustment. The sensor manufacturer SensoPart, based in Wieden near Todtnau, and also in Gottenheim near Freiburg since 2001, develops, produces and sells sensors for industrial applications. The main focus is on optoelectronic sensors, particularly laser sensors, which are used in so many industrial applications, and high-performance vision sensors for the detection of objects, colors or data matrix codes. The past years have been marked by a strong growth in turnover and the regular launch of new, innovative products. SensoPart has received several distinctions for its work, for example the Dr. Rudolf-Eberle Prize, 1st place in the BadenWürttemberg Prize for the Promotion of Young Companies, and has been awarded the German Sensor Application Prize several times. Further information can be found online at: http://www.sensopart.com.